When botanists speak of a woody plant, they describe its “growth habit”: the way a particular species sprawls like trailing arbutus, climbs like Virginia creeper, grows upright in a shrubby sort of way like highbush cranberry, or reaches skyward in the form we call a tree. Trees—red spruce, white pine, sugar maple, American beech—are the grandest of our plants. In the Adirondacks they monopolize nearly every corner of the landscape. Just as we insist, for good reason, that every child growing up in the Adirondacks learns to read, so each of us would do well to make conscientious study of the trees. It’s no secret that trees are enormously important. They contribute in myriad ways to our well-being and to our economies. A manageable number, a mere thirty-four species, typify the region’s core. Anyone old enough to go to school or young enough to venture into the woods (even if it’s with a walker or wheelchair) can learn to know them. How to do it? Aside from interest, the chief need is a field guide, a book to carry with you into the forest and help you learn. The market is crowded with good ones. Among the newest and best is David Sibley’s The Sibley Guide to Trees (Knopf, 2009). Two tree field guides by the botanist George Petrides, A Field Guide to Eastern Trees (Houghton Mifflin, 1988) and A Field Guide to Trees and Shrubs (Houghton Mifflin, 1972) are also fine. Still, if the North Woods will be your classroom, there’s one book that stands head and shoulders above the others. 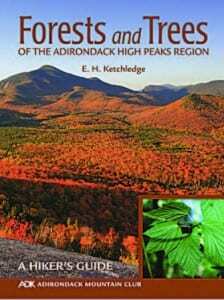 It’s Forests and Trees of the Adirondack High Peaks Region, first published by the Adirondack Mountain Club in 1967 and in print ever since. A snazzy new version, a reprint of the 1996 third edition with a brilliant cover photo to entice the buyer in the Age of Facebook, has just been issued by the club. It goes beyond its predecessors in one small but significant way. Included is a tribute to Edwin H. Ketchledge (1924-2010), the man who wrote the text and provided the interior photos. 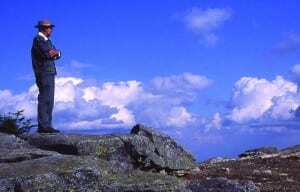 Ed Ketchledge looks out at his beloved Adirondacks from the summit of Whiteface Mountain. “Ketch,” as he insisted friends and students call him, was a gem of a human being, as anyone who knew him can tell you. He sparkled with facets. He was a veteran of World War II who fought with the 10th Mountain Division in Italy and eventually took a bullet in the chest. He was a student who earned degrees at New York State College of Environmental Science and Forestry (ESF), the University of Michigan, and Stanford. He was a botanist and ecologist based much of his life at ESF and its Cranberry Lake field station. 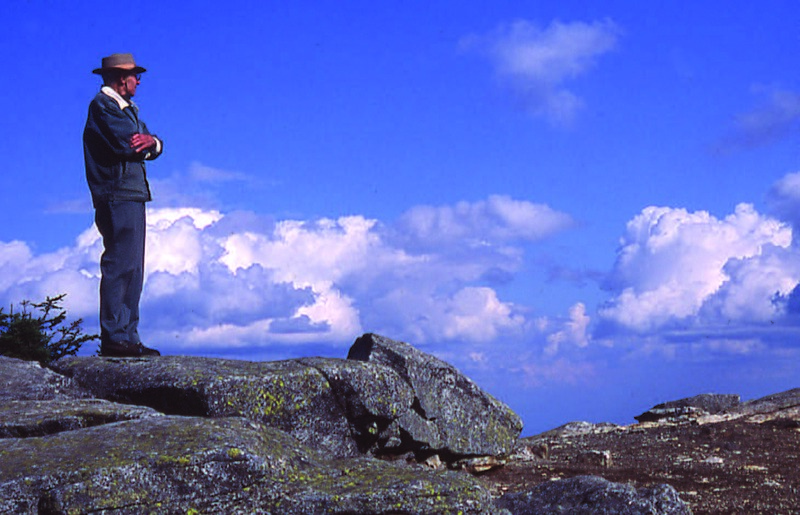 Above all, in the professional realm, he was a beloved teacher and Adirondack enthusiast, famed, among other things, for calling attention to the fragile flora of our High Peaks summits, teaching us about them, and developing novel methods for protecting and restoring them. He also walked fast. “A point of pride with me as a twenty-year-old,” recalls Mark Rooks, a former student of Ketch’s, now a wetlands ecologist with the Adirondack Park Agency, “was that I could keep up with a fifty-year-old with one lung.” I had the privilege of walking the Adirondack woods with Ketch only twice. The occasions were memorable. The first time, my entomologist and naturalist friend Wayne Gall and I spent half a day poking around Whiteface’s summit with the old man of the mountain. On the second, Ketch arrived in my driveway one bright, cold autumn morning. He and I spent a couple of happy hours prospecting our eighteen acres for mosses. In both places, I found myself captivated. Here was an expert secure enough to be down to earth, nearing eighty but bursting with the enthusiasm of a child. We laughed, we learned. I came away jealous of all those students who wandered the woods with Ketch for weeks on end. Brilliance in teaching does not always translate to brilliance on the printed page—and vice versa. 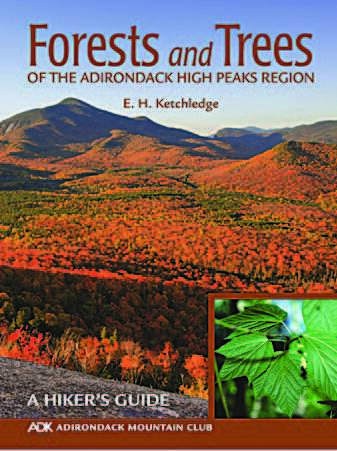 I remember picking up Forests and Trees of the Adirondack High Peaks Region for the first time and wondering if it could deliver any of Ketchledge’s magic in person. Happily, it does. The book is as entertaining as it is useful, perhaps because it covers subjects that Ketch brought to vivid life for his classes. He cuts through humdrum details and zeroes in on the important and engaging. Consider, for example, what Forests and Trees tells about aspens, which many in our neck of the woods call popples. (Popple derives from poplar, which in turn derives from the genus name, Populus, Latin for “crowd of people” and giving rise to the English word popular. Essentially, aspen and poplar are names for the same thing.) There are two similar species of aspen, the quaking and the bigtooth. A third related but less widespread tree is known as balsam poplar. To help us sort out all Adirondack trees, popples included, the book provides a dichotomous key that allows even the novice to work through a series of “this or that” choices. The key empowers the user to sort out the aspens from each other and to distinguish them from birches, maples, and the rest. Species descriptions and photographs follow the key. Here the reader finds a feast of tasty, helpful tidbits. “You may recognize Quaking Aspen with your ears,” the author writes, “because the rustle of aspen leaves is one of the most distinctive sounds in second-growth woods.” That sort of information is useful but, perhaps because it borders on the poetic, is absent in most field guides. Ketchledge also notes, “Curiously, Quaking Aspen is the first tree species to leaf out in the spring and the last one to turn color in the fall.” To the student of trees, this sort of information is a boon. A great many books written by scientists are, well, dry. It’s not that scientists themselves are dry. To the contrary, I’ve spent a great many thrilling hours running around with them, and I’ve found them as a species to be as redblooded and good-humored as the rest of us. The problem is that during grueling formal educations, they studied under senior scientists who drummed their feelings right out of them, or at least out of their professional diction and prose. The notion is nonsense, of course, that feelings have no place in science. Just read Charles Darwin or Stephen Hawking. Lack of passion was never an issue with Ketch. When he writes about the black cherry tree and notes that “The blackish fruit, maturing in late summer, is actually quite edible and makes a delicious jam or wine—take your pick,” you can tell he’s tasted the jam and sipped the wine and come away exalted. It seems a stretch to call any book indispensable. If there is such an animal, for Adirondack explorers it’s Forests and Trees of the Adirondack High Peaks Region. Take this book into the woods. Hear Ed Ketchledge’s voice regaling and teaching you. Come back enriched.